Big off center focus combines squares and rectangles. Choose one or many center fabrics cut from Fat Quarters or yardage. Blocks are 12" x 12" and 12" x 24". 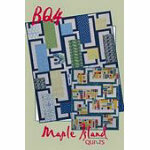 Two layouts and 5 quilt sizes: Wallcrib to queen: 24" x 36", 60" x 72", 96" x 108", 36" x 48", and 72" x 96".